Description of "Information Systems for Crime Management"
A collection of papers written by second year MBA students of the Vinod Gupta School of Management, IIT Kharagpur on the usage of data warehousing and data mining technologies in law enforcement. Some papers have interesting examples of IT systems that are in use in India and the United States. Prithwis Mukerjee, PhD is an engineer by education, a programmer by passion and an imagineer by intention. A B Tech from IIT Kharagpur, he did his MS and PhD from the University of Texas at Dallas, USA and then spent 18 years in the software business, working for companies like Tata Steel, Tata IBM, PricewaterhouseCoopers and IBM. Currently he is a Professor at the Vinod Gupta School of Management at IIT Kharagpur where he heads the Systems Area. 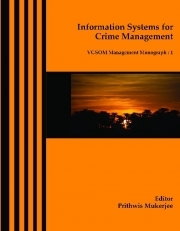 Reviews of "Information Systems for Crime Management"